When we reflect on iconic images of Hiroshima, Nagasaki, and their nuclear devastation, one of the first to come to mind is inevitably a mushroom cloud. Few people, by comparison, will stop to reflect on what the bombs responsible for razing these cities to the ground — codenamed Little Boy and Fat Man, respectively — looked like, themselves; or that they existed, at one point in time, undetonated — but chillingly patient. 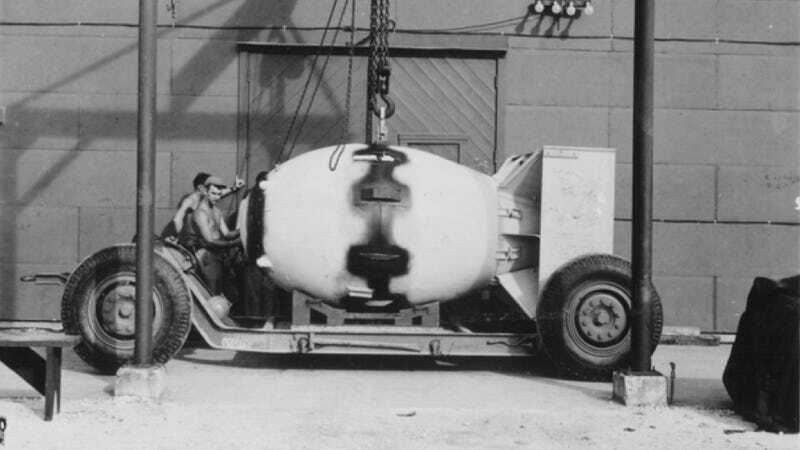 In 1945, this photograph [hi-res available here] of Fat Man on its transport carriage stood for many things. It was emblematic of a nation at war; the peak of technological and scientific innovation; and the future of international conflict. Today, however, it serves as a powerful reminder — of the lives lost; of humanity's enduring relationship with warfare and weaponry; and of an ongoing history of mutually assured destruction. Spotted on The Atlantic. Image via Wikimedia Commons.